(Nanowerk News) Understanding how chemical reactions happen on tiny crystals in liquid solutions is central to a variety of fields, including materials synthesis and heterogeneous catalysis, but obtaining such an understanding requires that scientists observe reactions as they occur. Now, scientists at the U.S. Department of Energy's (DOE) Argonne National Laboratory and the University of Chicago have developed a new technique that combines the power of nanoscale "tractor beams" with high-powered X-rays, enabling them to position and manipulate crystals in solution that are not in contact with substrates (PNAS, "Three-dimensional optical trapping and orientation of microparticles for coherent X-ray diffraction imaging"). With a pair of tweezers engaged -- each at one end of the crystal -- the Argonne scientists could manipulate the semiconductor microcrystal in three dimensions with high precision in the presence of a liquid solution and without exposing it to other surfaces. 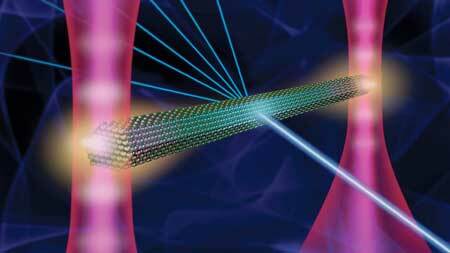 By pairing optical tweezers with Bragg CDI, scientists now have a new way to explore materials in liquid media, explained Brookhaven National Laboratory (BNL) scientist Yuan Gao, the first author of the study. "Our discovery comes from a combination of different techniques -- including pairing lasers with the coherent beam from the APS," he said. "To make the experiment work, we needed the nanofabrication technique at the Center for Nanoscale Materials to make the sample cell as well." The Center for Nanoscale Materials (CNM) is also a DOE Office of Science User Facility.